I visited Cape Cod last weekend and painted with my friend Erika and produced two little landscapes in acrylic. When I got home I thought, “Geez, where am I going to put these?” My paintings are going to move me out of my apartment some day! Such is the case, I’m sure, with many artists who have had only nominal success at showing and selling their work. As you can guess, it got me to thinking about all the artists in history who have either lived in total obscurity, or have had modest recognition by art historians. My mind then wandered over to a whole group of artists who are little known, if known at all by most people who study art: art pottery artists of the late 19th and early 20th centuries in the US. Interestingly enough, many of those artists were women. During the last thirty years of the nineteenth century, there was a revolt by some decorative artists against the poor quality of mass-produced objects, such as furniture and ceramics. The Arts and Crafts Movement, which arose first in England in the 1860s under William Morris (1834–1896), spread to the United States in the 1880s. The overriding concern of the movement was the return to hand-crafted objects designed and executed by a single artist. Thus, “art pottery” was born, as distinct from commercial, mass-produced wares. Starting in the 1880s, pottery painting had become very popular among American women. It was considered a “refined” occupation for “well-bred” women to undertake. This was due to the fact that the art form could be executed in the home. The popularity of pottery painting among American women spread quickly and pottery societies were formed under women’s leadership all over the country. They soon changed from simply painting pottery to modeling, firing, and glazing ceramics. Ironically, an art vocation meant to keep women in the home actually led to hundreds of women working in pottery factories throughout the US. The Rookwood Factory was founded by Mary Longworth Nichols. By 1905, Rookwood’s pottery standards were so high that the firm achieved a success unequalled by other American art pottery companies. 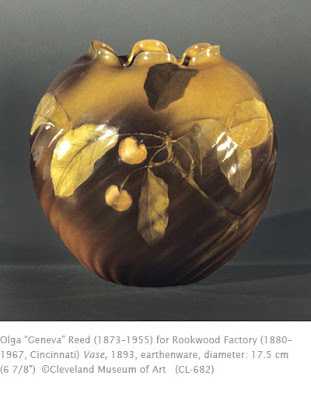 Olga Geneva Reed was one of the many women employed at Rookwood to decorate the wide variety of shapes of ceramics produced there. Reed was born in Cincinnati and attended the Cincinnati Art Academy. She worked for Rookwood until 1928. She is primarily known for floral and vegetal decoration on the pottery. She was one of Rookwood’s more renowned decorators, even though today her name is hardly a household word. Her work was so admired at the time that several of her works were exhibited in the Paris Universal Exposition in 1900 under the name of “Geneva Reed.” This lovely piece bears the influence of the Art Nouveau style. Site with lots of information about Rookwood Pottery and lists of artists. Rookwood Factory’s main site. I once had lunch in one of their restaurants that is in one of the former kiln rooms. It’s awesome! I love your thoughts on pottery painting. Great resource for artist.